I learned about a new variety of basil, thanks to a comment from Reader Sue: Blue Spice Basil. It is planted by her back door and releases the scent of vanilla when she brushes by. Herbs drew me to gardening, and I have so many books, resources and stories to share, but this morning, I want to think about how a plant called “Blue Spice” could be associated with the scent of vanilla and early-morning fragrance. I looked to my two sources for seeds, and found this variety at Johnny’s Selected Seeds in Maine. I want to learn more — its history, its uses. I suspect it is not an heirloom variety, because Seed Saver’s Exchange does not offer it. It seems that you could plant an entire garden of basils only — the variety of colors, shapes, scents and flavors is quite impressive. 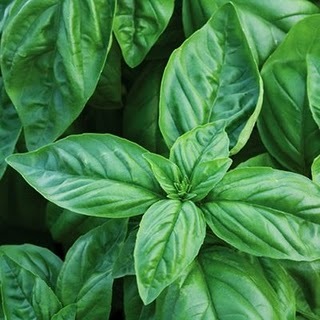 I am growing Italian Large Leaf basil this year, because pesto is a staple in our home. After spending buckets of money for small plastic tubs of the stuff, I decided that this was one way I could contribute to our family’s bottom-line: make and freeze as many packets of pesto as my freezer drawers will hold. We finished last year’s harvest at the start of the summer. I am about to start the Pesto Production Line again….although I am missing pignoli nuts. I need to find a source of these gems in large quantities at a reasonable price. And while I am picking my basil leaves, redolent of Mediterranean warmth, I will dream of this other basil, that rewards a gentle touch with the scent of vanilla. I would love to start every day in this way. Blue Spice Basil. I see the blue in the blossoms. I imagine the scent. Italian Large Leaf Basil. I have plans for you. You’re correct —it is a hybrid, not an heirloom, but well worth growing. In the early morning, when all is damp and still, that fragrance just perfumes the air. I hope you enjoy it as much as I do. I’ve never been one to turn my nose up at a hybrid — especially when it is a plant! Any endeavor that results in fragrance gets my vote. We were talking about your blog over dinner tonight. We buy pignolis in bulk at Costco. Olivia says that the New York equivalent is BJs. I’m honored to have sparked a discussion about pignoli nuts! We have Costco’s out here, too, but none close enough to make the trip worthwhile, as BJ’s is so close by. I can only imagine how Olivia described the typical BJ’s shopper….please know that I do NOT fit the stereotype!! In fact, Olivia knows that if I ever so become a BDB (Barn-Door Babe) she has my permission to shoot me. So I watch my pignoli intake…. To what extent is it a hybrid? By that I mean….will it reproduce more-or-less true to form by seed? Or does it change radically? What is it a hybrid of? I like to save seeds, but not if they don’t reproduce more-or-less true to form. I don’t know — what an interesting question! I will see what I can find out about this! I agree with you, if you’re going to make the effort to save seeds, you should be confident in your results. I love my book “Seed to Seed,” by Suzanne Ashworth. Lots of useful information. If I can get an answer to your question, I promise to share! Just fyi: I just emailed Johnny’s Selected Seeds, as they offer this variety, and asked about this. I will let you know what I hear! Thank you for your inquiry. 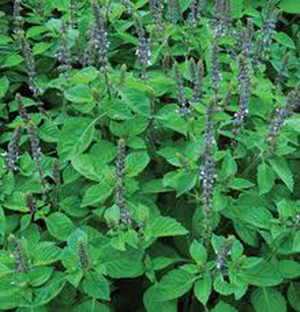 The Blue Spice Basil is a hybrid variety (F1), so it would not produce true to type if you saved the seeds. A hybrid plant will show more vigor and uniformity than non-hybrids (Open Pollinated varieties or Heirloom varieties), but the characters of (F1) hybrids are not stable, so seed saved from the plants will not breed true or produce the same variety of plant. If it was an open pollinated variety then you could save the seeds to plant the following year and will produce the same variety of plant year after year.